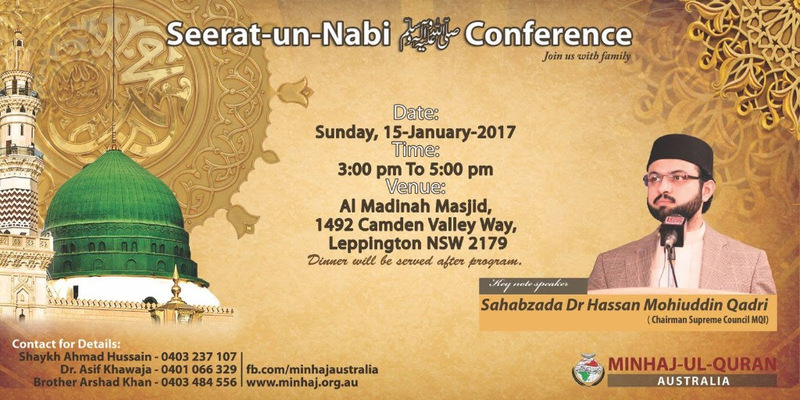 You are all invited to attend the Seerat un Nabi SAW Conference on Sunday 15th January 2017 at 3-5pm. Special guest will be an International speaker Sahibzada Dr. Hassan Mohiuddin Qadri. Please attend with your family and friends. Note: Dr. Hassan Mohiuddin Qadri is the elder son of Shaykh-ul-Islam Dr. Muhammad Tahir-ul-Qadri and will be speaking to Sydney-siders for the first time. So please do not miss this rare opportunity to meet a prominent scholar.